Two undeveloped islands off North Haven, 15-acre Burnt Island and 25-acre Sheep Island, support two pairs of nesting eagles that are among the most successful in the state. Between 1970 and 1989, the Burnt Island eagle pair (or their successors) raised more than 21 eaglets, according to Charlie Todd, a wildlife biologist with the Maine Department of Inland Fisheries & Wildlife. The Sheep Island nest, first constructed in 1990, has fledged 16 eaglets in 13 years. The productivity of these two nests, Todd says, is 33 percent better than the statewide average. Biologists attribute this high productivity to a natural setting that offers some of the state’s best available eagle habitat. 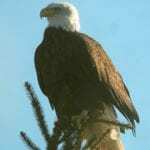 When eagle populations were at an extreme low in the early 1970s, this territory still supported a breeding pair–the only eagles at that time in Penobscot Bay. Now the Bay has 20 nesting pairs, none more productive than the ones on Burnt and Sheep Islands. Many other bird species also benefit from the protection of these islands. The setting is frequented by oldsquaws, mergansers, common loons, Canada geese and a variety of migratory songbirds. 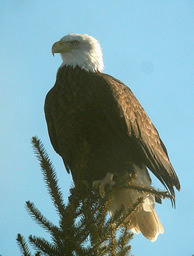 Both islands allow for public access outside of eagle-nesting season. From mid-August on, boaters can enjoy a popular picnicking beach that lies close to the route of the Maine Island Trail (a 325-mile long waterway extending from Casco Bay to Machias Bay). The Land for Maine’s Future program and The Nature Conservancy enabled the State’s acquisition of both islands, which are now owned and managed by the Maine Department of Inland Fisheries and Wildlife.